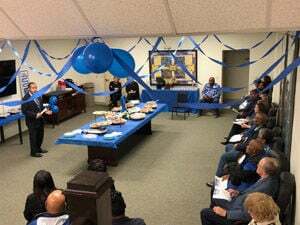 Gastroenterologist Theopolis Gilliam, Jr., M.D., speaks to the Lawrenceville Cancer Research & Resource Center about colorectal cancer for the “Dress in Blue Day” program last week. Gilliam said that it’s particularly important for people in Southeastern Virginia to have early screening. Gilliam said that while there many screens out on the market, the gold standard is the outpatient colonoscopy. Patients have the procedure and then go home. He added that the other tests available, such as those advertised on TV, can be done by patients, but they are not infallible, and if any irregularities show up you will still have to have a colonoscopy. Gilliam practices at Southside Physicians Network in Emporia and Petersburg. For information on his availability to speak to civic groups, schools, and church groups on the subject of Colorectal Cancer Prevention call (804) 765-6650.